Whirlwind Lodge: Can I single someone out? Let me tell you a story. It's about a woman who'd been badgered by her husband for a few months about starting a blog, because he had started one recently, and it was fun to be able to "publish" your own stuff...to get out there and be heard, whether it was regarding politics, family, your dog, music, religion...whatever. You were getting out there and making yourself heard. The woman listened to her husband, probably shaking her head a couple times, hoping he'd stop with the convincing already - she didn't need someone pushing her into yet another thing she didn't have time for! She had a full-time job, a few kids and her husband to care for, an extended family to keep track of, and a household to run. She didn't even have time to go out and get a cup of coffee! People like her didn't have hobbies...even hobbies with a purpose! She finally gave in, for no reason in particular. Maybe just to get him off her back ;) But she created this blog, and then she got almost passionate about making it "just so"...the right look, the right feel, the right sidebars, etc. She may not have an OCD diagnosis, but it rears its ugly head sometimes, and if she was going to do this, she was going to do it her way!! 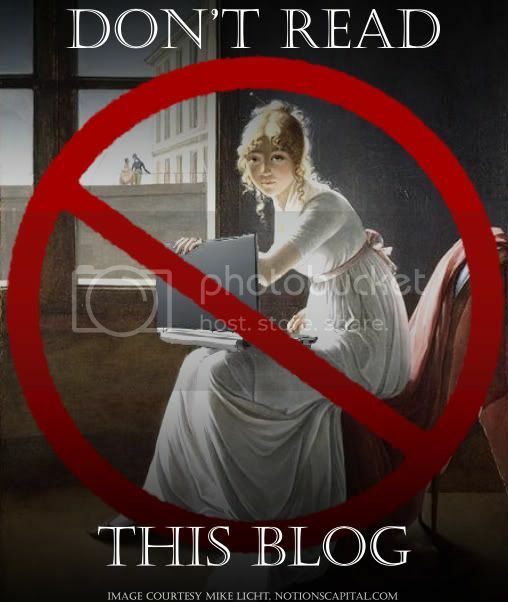 The blog took off. Not famously, mind you - but she had a few subscribers, and while exploring the world of blogs, she found others who shared the same interests, others she admired because they were living a life she was unable to at that point, but dreamed of having some day, others who had passion for something and it showed in their writing. She even had a BlogRoll of her favorites. She visited them every day, looking for an update, a photo, a "Hi, I'm here!". She even befriended a couple other bloggers, and although they were separated by distance, they were kept close via email. Time went on, things got busy, life happened, as it often does. But these friends never forgot about each other. If a blog didn't get updated in awhile, an email was sent to make sure all was well. Sometimes, just a funny comment was left on the last blog post. This story is about me. And while I've had the pleasure of meeting one of these people, Ness, there is another I have yet to meet. Her name is Lisa, and I know I've linked you to her blog on several different occassions. She grows the most amazing pink tomatoes, she sent me some seeds that she saved from her very own garden from last year, and she has an awesome Etsy shop (I'm in love with the Lemonade Coming Right Up set!!!). 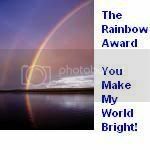 Anyhoo...this special friend of mine has done something wonderful again, and this time it was completely unexpected!! She posted a few days back about a ginormous mulch pile in her yard, and how she dealt with that and then worked in her studio (she has a studio...how cool is that?!?!?). So she posted a couple pictures of the things she was working on, and I actually looked at one of them and thought "How cool! Those are LMJM's room colors!!". Much to my surprise and delight, I walked into the house after work today, sat down at my desk to give my feet a rest, and noticed a package sitting in front of me, addressed to the baby!! Her very first piece of mail!! Miss Lisa sent LMJM something beautiful, handmade, and very special. I realize the picture is a little blurry to do it justice. It's a gorgeous hand-crocheted sweater for our almost-here-newest-addition!! Isn't it gorgeous?!?! 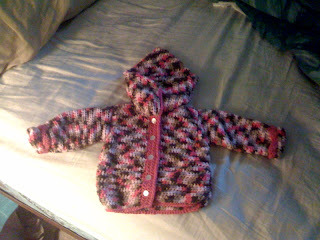 And it's a perfect size for this fall/winter, when LMJM will need the warmth against the Missouri weather. She also included a card, written to LMJM, which I promptly read aloud to her inside my belly. I'm glad I read the card before I opened the wrapping, because I teared up immediately, and for once I'm not going to blame the pregnancy hormones (okay, maybe a little, but not much). So, this woman, someone I've never even met before, has not only given me the gift of friendship, but has given my unborn child a gift as well. I cannot wait to put this special something on LMJM and show it off!! Lisa is truly a blessing to have as a friend. Go visit her blog and read all about her life, and find the jewel of a friend that I've been lucky enough to find. Lisa, I can't thank you enough...truly. Words don't even come to me. As for Big Boss Man, I owe him a thank you too. Without him, I would've never created this blog, and consequently never "met" these women, whether or not I've met them in real life (yet!). I love you. What a beautiful gift! Lisa is one special friend indeed! Just don't think of me too hardly when you get it on the baby and the hood covers her whole head or something!! I have be blessed to have "met" you too! Barely a month to go and then we can meet LMJM too! You know... maybe I just might need some Penn Station from across the river. LOL!!! !